History of Music For The Hearts! 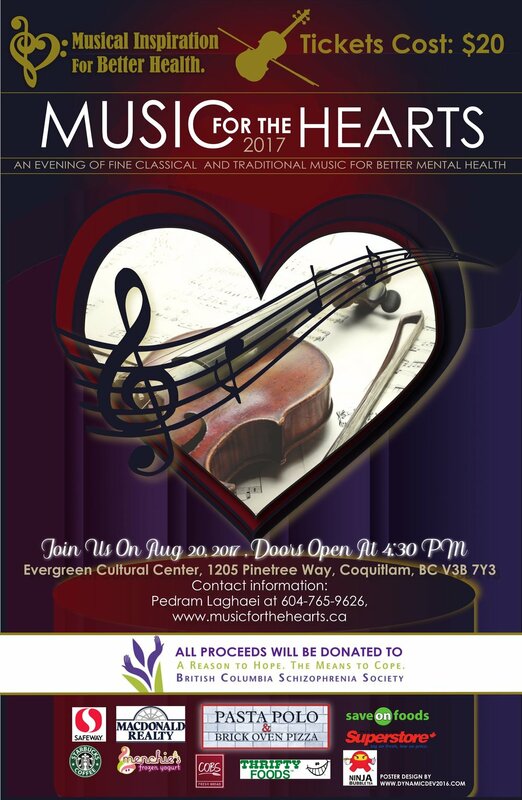 For the special 5th annual concert, the MFTH Organization welcomed over 150 guests at the prestigious Evergreen Cultural Centre. On September 15th, 2018, the concert featured a variety of classic and contemporary pieces performed by 36 young and talented musicians and choir performers. With the collective efforts of the community, including sponsors and volunteers, the organization was pleased to have raised a net amount of $3,150 for BC Schizophrenia Society. The funds were used to directly support families coping with schizophrenia, educate the public on mental health awareness, and contribute to the improvement of medical services for those with severe mental illness. This year, MFTH Organization hosted its 4th annual musical concert at Evergreen Cultural Centre for over 200 guests. On August 20, MFTH 2017 featured a variety of popular classical and contemporary music performed dedicated musicians. With the collective efforts of all those involved, including sponsors and volunteers, the MFTH Organization raised a net amount of $4,000 for BC Schizophrenia Society (BCSS). The funds were used to work towards achieving BCSS' mission, including supporting families and friends of people with schizophrenia, educating the public, improving mental health services, supporting schizophrenia research, and more. The MFTH Committee hosts its 3rd annual musical fundraiser at the grand St. Laurence Anglican Church for over 150 people. On August 27, MFTH 2016 featured popular classical and traditional Eastern music performed by a diverse group of talented musicians. With the generous and much-appreciated help from a variety of food, financial and media sponsors, the MFTH Committee raised $2,700 for Eagle Ridge Hospital's Campaign for New Operating Room Equipment. The raised funds were donated to aid the purchase of an essential pediatric bronchoscope. MFTH comes to one of Port Moody's prestigious theatres! On May 2nd of 2015, the MFTH Committee hosted a spectacular musical concert at the Inlet Theatre and Galleria! Over 200 seats were filled in the audience, and almost $3,000 was raised for Eagle Ridge Hospital's Emergency Equipment Campaign 2015. MFTH Committe was very glad to have the full support of many wonderful food and financial sponsors, talented musical performers, and dedicated volunteers. 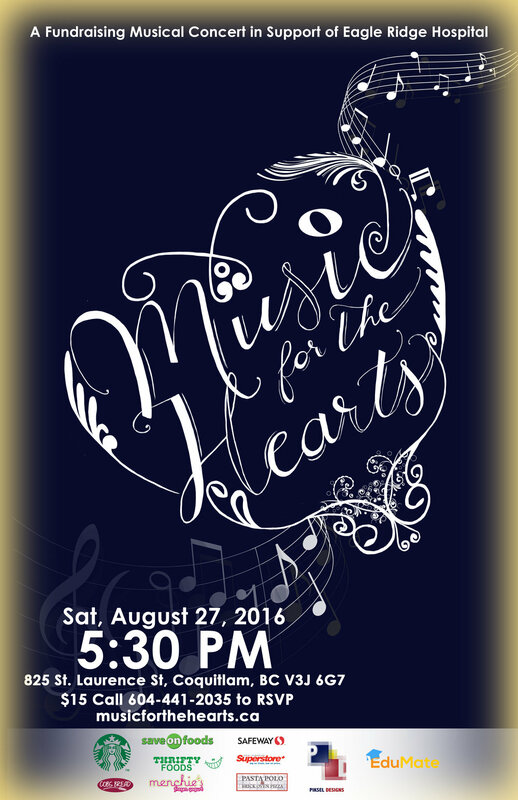 Music For The Hearts (MFTH) kicks off its very first event! In July 2014, the MFTH Committee hosted their first event at King of Life Lutheran Church in Coquitlam. After months of planning and with the support of several food and financial sponsors, talented musicians, and volunteers, the MFTH Committee raised over $2,300 for Eagle Ridge Hospital Foundation!